Royal Frosting (recipe below) is the glue holding the graham crackers together forming a little coop to house a marshmallow peep that sits upon a nest of tinted coconut. 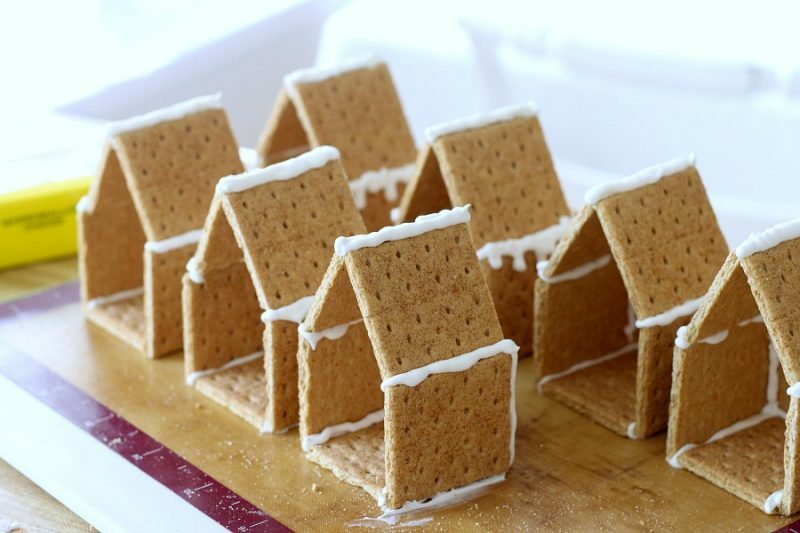 The graham crackers cut easily with a sharp knife. I glued three sides to a bottom and then the roof pieces. 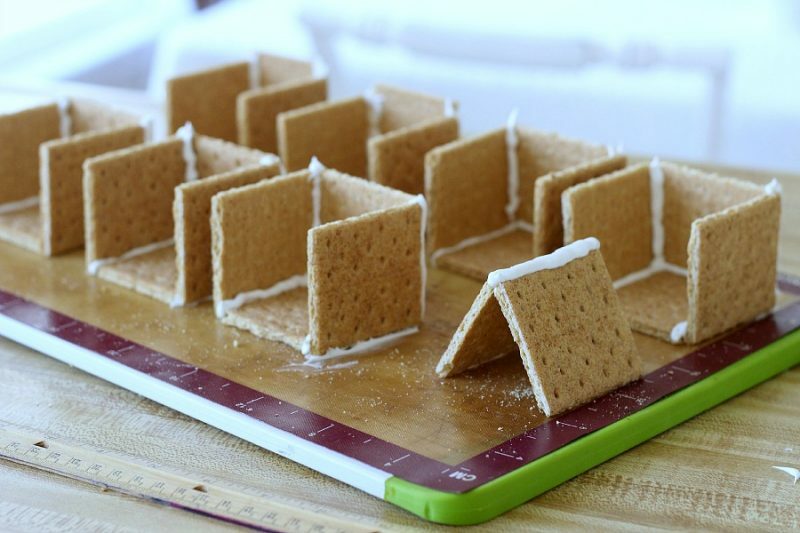 After the frosting hardened, additional frosting was piped on to attach the roof to the sides. 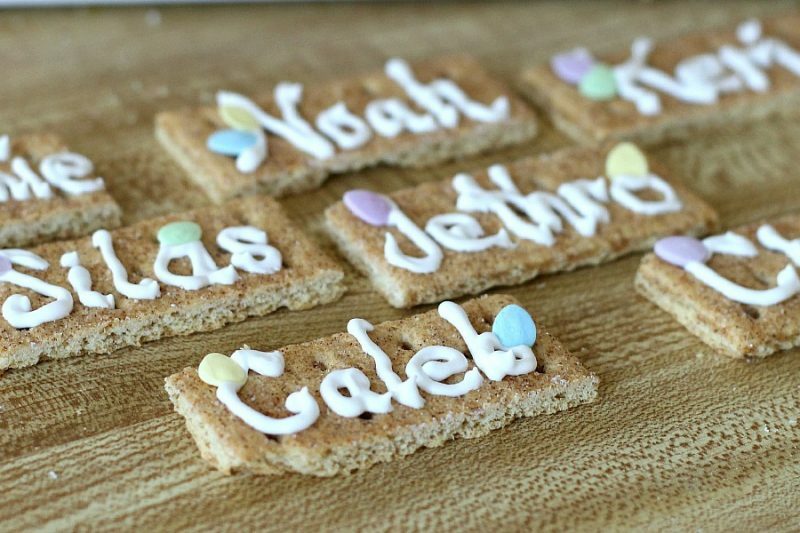 I piped some extra frosting onto graham crackers to make seating tags. The kids thought is was fun to see their names and then be able to eat the place markers. The kids table is decorated with the cute coops and ready for brunch. Five of the kids sat at this small round table and everyone else at the large table with baby Jethro in a highchair. In the past I have always prepared and serve Easter Dinner but this year we ate earlier and I served brunch foods. 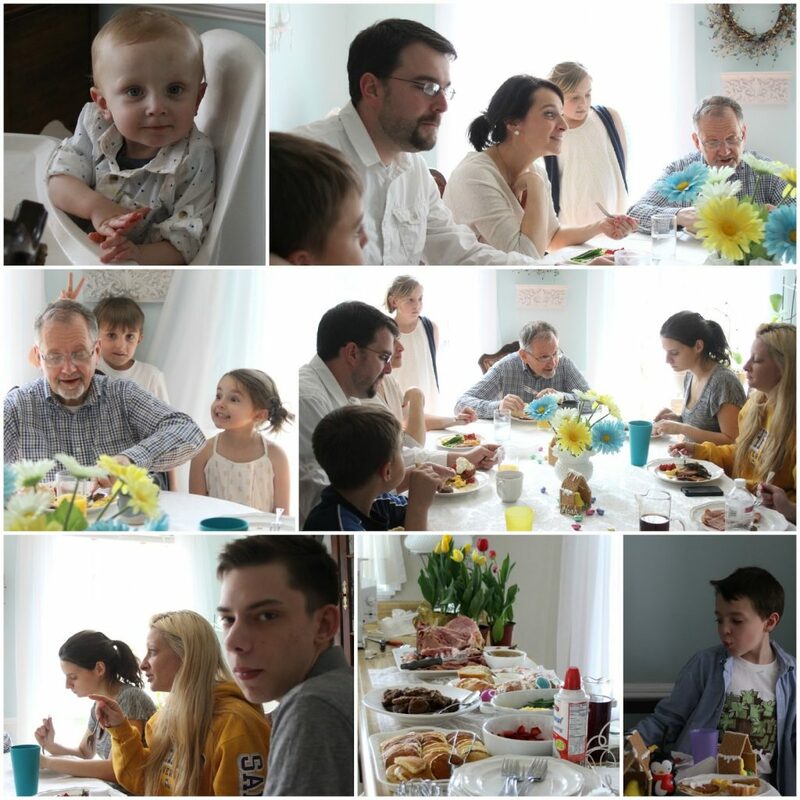 The menu included, ham cooked in the rotisserie served with Pineapple Ham Glaze on the side, our traditional Easter Bread, Fluffy Pancakes with strawberries & whipped cream, fried sausage patties, scrambled eggs and asparagus. Follow the links for the recipes. With full tummies, we did some chillin’ before dessert. 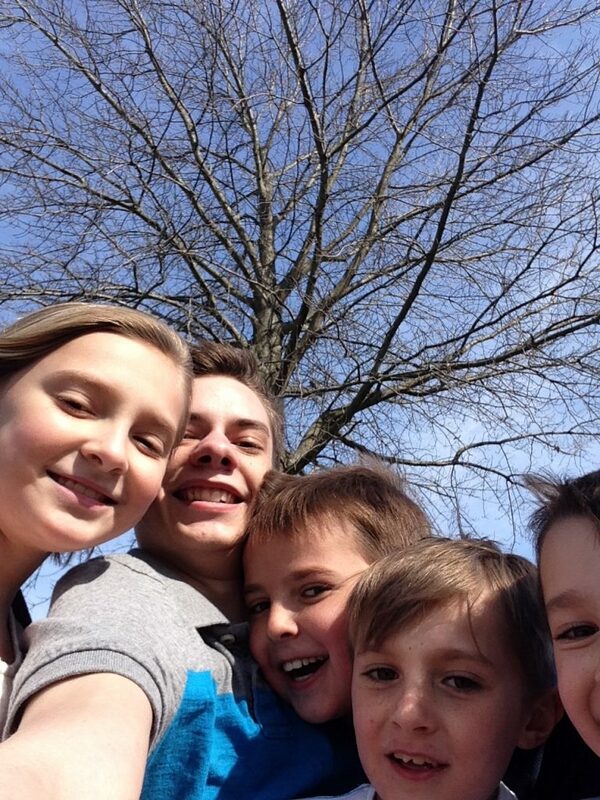 Jared, the oldest cousin, took some of his younger cousins to the park and even got a photo! And, though Jet continually tossed food from his highchair to our miniature schnauzer, Raider all during dinner, he was not about to share his peep house! 3 egg whites (or 1/4 cup meringue powder combined with 1/2 cup of cold water in place of the egg whites) I prefer meringue powder instead of the egg whites and so do not need the cream of tartar. In a large bowl, whip the egg whites with the cream of tartar until foamy. Sprinkle in the sugar gradually, whipping all the while. 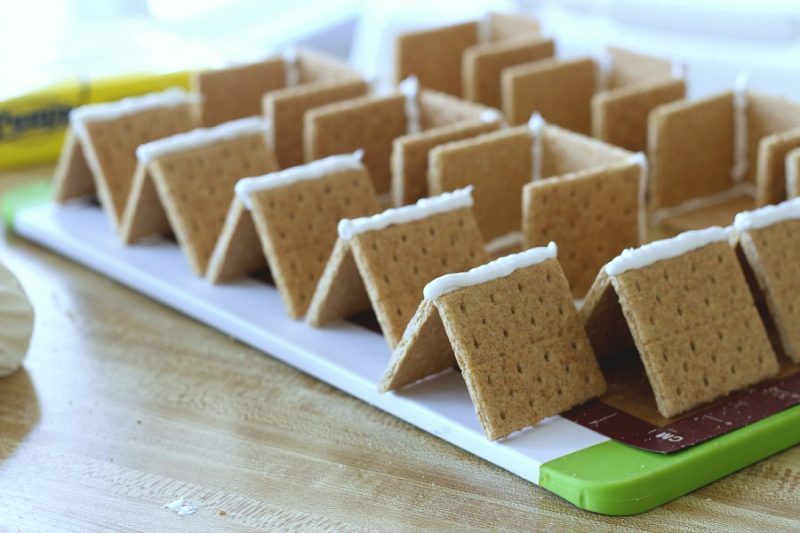 The more you whip the icing, the stiffer it will be and the faster it will harden up. Cover the bowl of icing, taking out only as much as you’ll need immediately. The easiest way to store the icing for long periods of time is in a plastic pastry bag, or zip-top food storage bag. How adorable!! You are so talented. Everything looks beautiful and I know it was a good time for all. The kids are so,so cute! PLEASE have your hubby get the shingles vaccine! My daughter has them and they are horrid and so extremely painful. It's like having all the nerves exposed and she can't stand anything to touch her when she has a breakout. Have you had the vaccine? Sweet faces around your table(s), Lorraine! 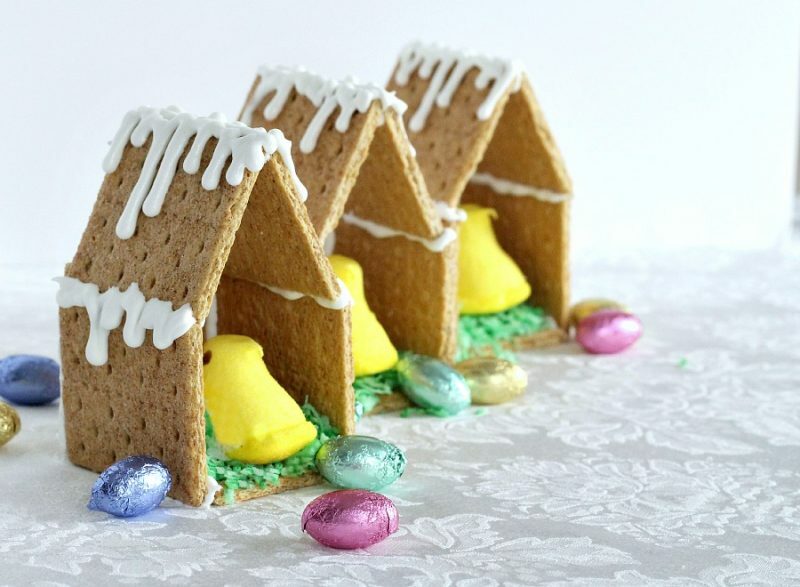 Awe, those Peep Houses are just the cutest and what a wonderful family time. Another great post! 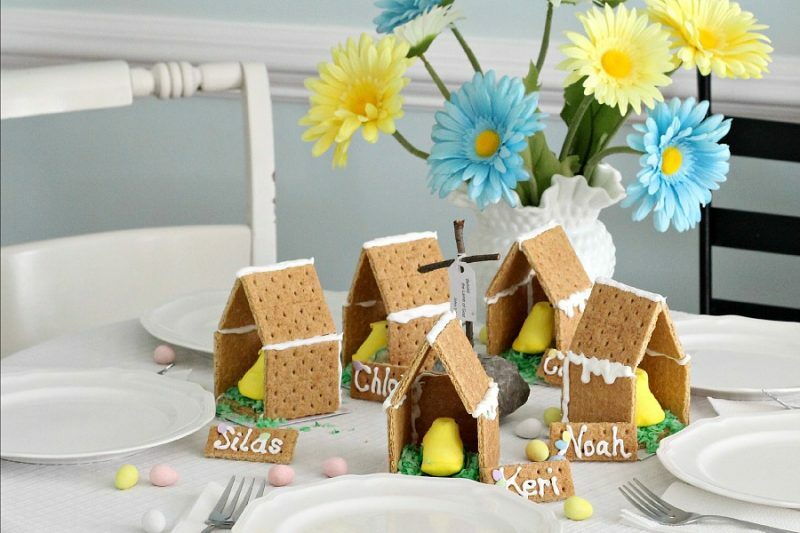 What a charming little peep houses! They truly are just so adorable! 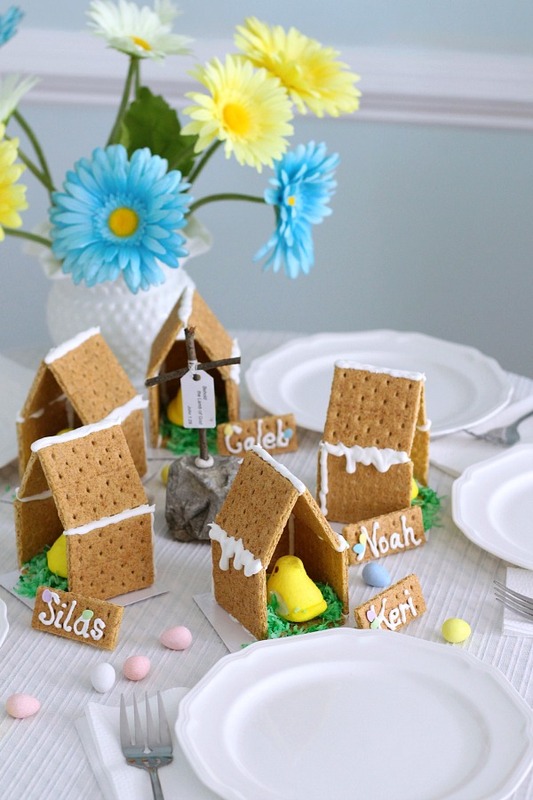 Hi, I loved seeing your Easter brunch table as well as the Peep Gingerbread Houses. So very fun. Your table and dishes were beautiful. How many did you have in all-we had 17 total and it was a ball. 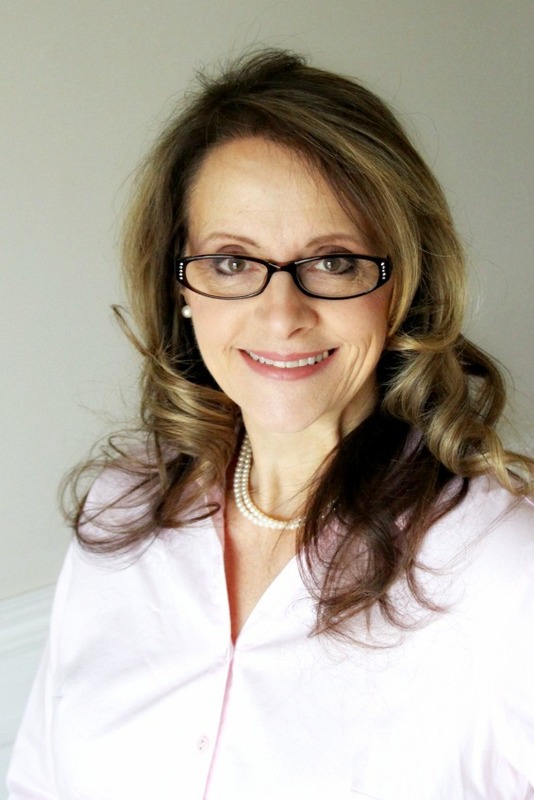 You mentioned on Debbie's blog whether your hubby should get a Shingles shot-I'm here to stay that I had shingles when I was 42 and it was horrid. I'd much rather get a shot than have it. In fact, I need hubby to get one. Your man won't be sorry! 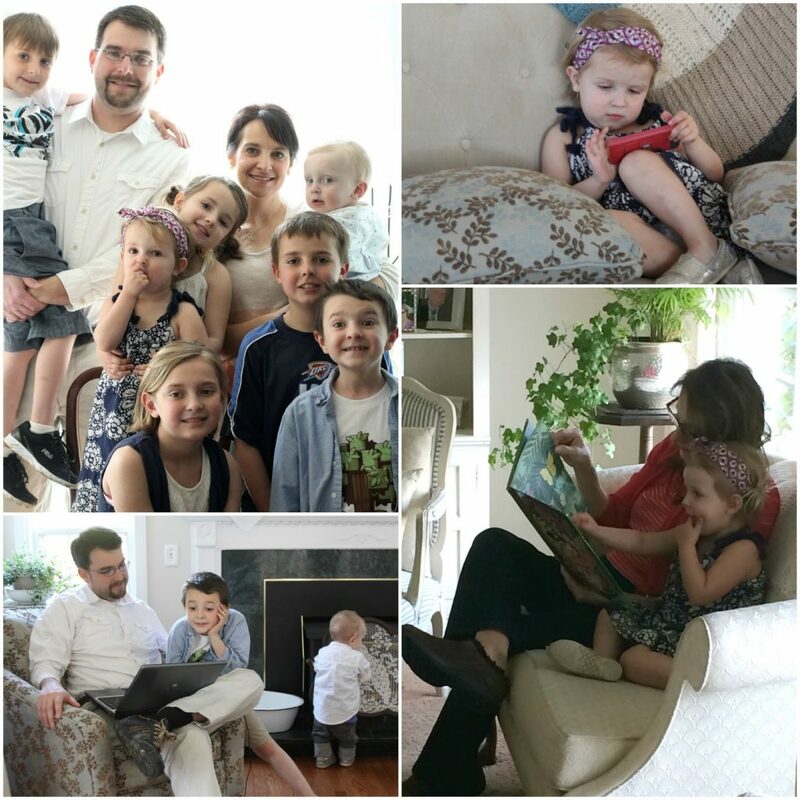 Grands and family make the world such a blessed place.Thanks for stopping by my place today. 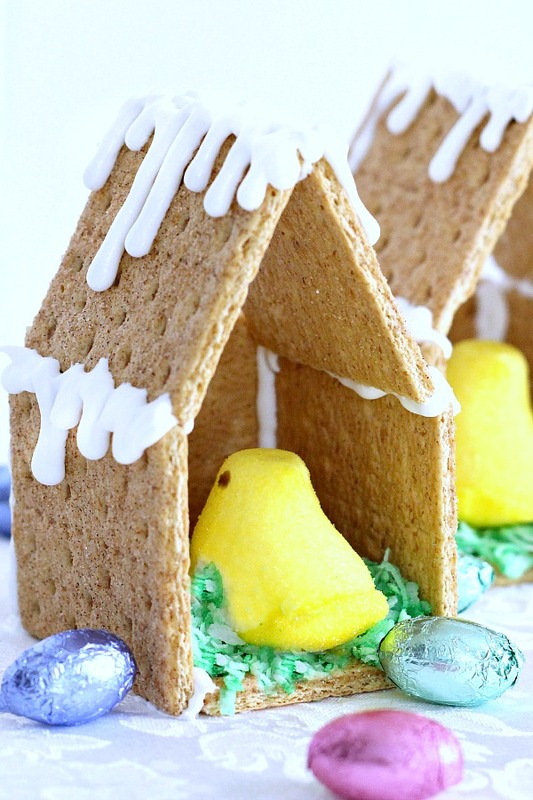 As much as I know I should, I would be reluctant to share my Peep house, too. So cute and so are your grandchildren. Have a beautiful spring day! Aw, those are SO CUTE!